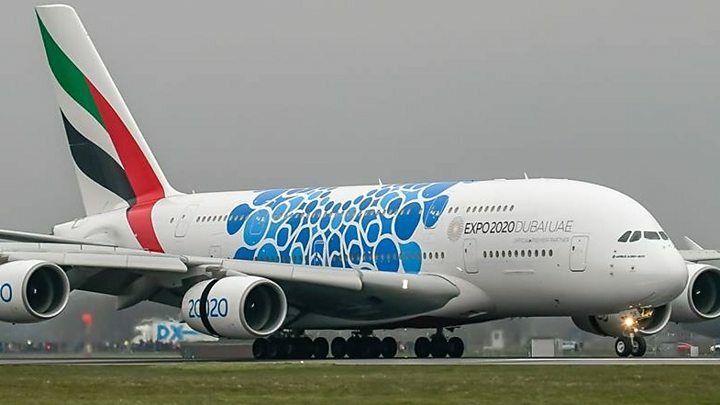 The world's largest commercial passenger aircraft has landed in Glasgow, signalling the start of regular services to and from Dubai. The Airbus A380 touched down at Glasgow Airport at 19:45 on Tuesday, after more than £8m was spent to prepare for its arrival. Also known as the superjumbo, the double-decker jet, was welcomed by scores of onlookers. A piper was playing on the tarmac to welcome the plane. The Airbus first paid Glasgow a visit five years ago, marking 10 years of flights from the city by the Emirates airline. Since then the airport has made significant changes to accommodate regular flights, including alterations to the airfield layout and the building of Scotland's only triple air bridge. After Tuesday's landing, the superjumbo will be seen flying to and from Glasgow on a daily basis. The A380, which costs $400m on average, has a maximum takeoff weight of 575 tonnes - the same as about 45 double-decker buses. It can carry about 550 passengers - but with capacity for more - over a range of 8,000 nautical miles.